Have you ever wondered what you would consider to be a great romantic inn in Southern Maine? Prior to our recent trip to Ogunquit, I did in fact ask myself this question and what I came up with was that it should be fairly small, as we would want privacy yet not too much privacy. It should be reasonably priced offering good value. Restaurants should be close by with at least one or two top notch establishments where we could savor delicious Maine lobsters. Absolutely not fast food chains! The pace should be less hurried so that we can meander about checking out art galleries and craft shops. Nearby should be an accessible walking path overlooking rugged, granite rocky cliffs, white long sandy pristine beaches and evergreens rising above birch trees. And as for my artist wife Lily, it would be neat if she would have scenes of salt marshes and pine woods to paint. And most of all the rooms, service, and ambience must be impeccable. Did we find such an inn? Yes. Fortunately, we discovered The Hartwell House Inn & Conference Center in Ogunquit that includes all of the above and more. We even felt it was built solely around our own particular tastes and confidentially, we hoped that no one else would find out about it, although I am sure the innkeepers would not appreciate our keeping it a secret. The Hartwell House Inn & Conference Center is a cozy 16 room inn with a little history and a lot of charm. It is located forty-five minutes from Portland, an hour and half from Boston and five hours from New York City. The owners, Jim and Trisha Hartwell, first met in Ogunquit where Trisha was a student working during her summer holidays. After they were married, they promised each other that their first investment in property would be in Ogunquit. The Hartwells purchased the first of their buildings, now known as Hartwell I, in the early 1970s. This property was originally a private residence built in the 1950s. As pointed out to us, even though the home was built in the 1950s, it does have some distinguishing attributes that were incorporated into it by the former owner. Upon entering the inn you will notice the 200 year old wide pine plank floors and a governor McClintok fireplace mantelpiece located in the cozy living room. In 1980 the property underwent renovation and was expanded from four bedrooms to seven with two studio apartments. Six years later the building diagonally across the street was purchased where the managers of the property would reside. This was followed shortly thereafter with the addition of four more bedrooms and three large suites, all with private bathrooms and air conditioning. This is now known as Hartwell II. Another property directly across the street from Hartwell I, The Thompson House, was purchased in 1989 and it was renovated in 1993 for commercial purposes. The property was previously owned by Mabel Thomson who died in 1980 at the grand old age of 103 and the Thompson's had owned much of the land outside of Perkins Cove. The family had lived in the Thompson house since the early 1700's. It was in 1994 that the Hartwells constructed the Plaza building and the entire complex became known as Thomson Green. At the time the complex was designed, provisions were made for the Hartwell House Executive conference room and function facility, incorporating design characteristics found in both Hartwell House I and II. There is also the SW Swan Bistro that presently is under renovation and should be opening within the next few months. Recently, the Hartwells engaged the charming husband and wife team of Todd and Maricela Lettman as their new innkeepers and managers. The Lettmans come from Texas and with them they have brought an abundance of southern hospitality, energy, enthusiasm and fantastic skills. This was quite in evidence when we had the opportunity to meet them during our stay at the inn and they definitely provide the impetus to the relaxed ambience that is so prevalent in the inn. Todd mentioned to us that he has worked as an executive chef or sous chef for Omni, Embassy Suites, La Costa Resort and Spa, Ashton Hotel, and Hyatt. Maricela has extensive experience as a sales and social catering manager having worked for Embassy Suites and the InterContinental. And if Todd's breakfasts and his "wicked" afternoon cookies served during tea time are any indication of what he will be bringing to the SW Swan Bistro when it opens, you can be assured that the place will be hopping. Moreover, the inn presently is in the midst of expanding their wedding destination options and they will be offering in-house catering services under Todd's expert supervision- something they didn't do in the past. Now, with the mixture of Todd's vast culinary expertise and Maricela's management and catering skills, you have the makings of a first class wedding destination. The rooms in the inn have a cozy, romantic ambience that attracts couples of all ages. Simple but elegant, they are roomy and tastefully furnished evidencing a designer's touch with their gorgeous American and European antiques. All are named after famous Americans such as John Quincy Adams, James Monroe (Honeymooners Favorite), Martin Van Buren, Dolly Madison, Winslow Homer and other familiar historic personalities. There are even two very large two-room suites with queen sized beds, separate sitting rooms, even a kitchen area with a standard refrigerator, microwave, sink, and coffeemaker. The luxurious bridal suite is one the second floor of Hartwell II that comprises a two level sitting area, with skylights gracing the bathroom and bedroom. Most of the rooms have French doors leading to terraces or balconies that overlook beautiful flower gardens where many a wedding has been hosted. As a special bonus and without bothering with parking problems that sometimes can prove to be quite a challenge, the Hartwell's guests have easy access two of Ogunquit's prize venues, Perkins Cove and the Marginal Way footpath. Both are a mere five minute stroll where the magnificent views overlooking the ocean are stunning. The Abenaki tribe were right on the mark when they named Ogunquit, "beautiful place by the sea." Trendy Perkins Cove is known for its wealth of art galleries, quaint shops and restaurants, as well as its unique foot drawbridge overlooking the small harbor where boats can be seen bobbing in the water. It even has some history attached to it as it was once a thriving art colony in the late 1800's when an art teacher, Charles Woodbury from Massachusetts first set his eyes on the cove and it is reported that he proclaimed it to be "an artist's paradise." It was Woodbury who had been instrumental in setting up the Ogunquit Art Association and many prominent artists of the day including Hamilton Eastern Field either visited or worked at the cove making it one of America's most important art colonies. It was Field who is credited today with attracting two movements of modern art to the Cove, expressionism and abstraction and it was he who had built the Ogunquit School of Painting and Sculpture. Even today artists swarm to this area in order to capture on their canvasses the gorgeous beauty of the area. The history of the Marginal Way dates back to 1923 when the Town of Ogunquit received it as a gift from Josiah Chase of York. The scenic foot pathway is over a mile in length as it snakes along a rocky edge of the cliff overlooking the ocean. As we took our exhilarating morning strolls on the path, we couldn't help mentioning to ourselves that this was beyond doubt a incredible site of natural beauty with its snarled bayberry and bittersweet bushes, fragrant pink and white-sea roses, fascinating alcoves providing shade, and benches for those who just want to sit and appreciate nature and observe the powerful energy of the ocean. And if you are looking for culture, there is plenty available. Nearby you will find the well-known Ogunquit Playhouse which rightfully promotes itself as "Broadway at the Beach." The playhouse in 2007 was enjoying its 75th Diamond Jubilee and what could have been more delightful than attending a performance of The Full Monty starring Sally Struthers of Gloria of the famous television show All in the Family and Adrian Zmed, who is one of the most recognizable faces in the entertainment industry. This is first class entertainment with most of the performers coming from Broadway. The season generally runs from June until early October. 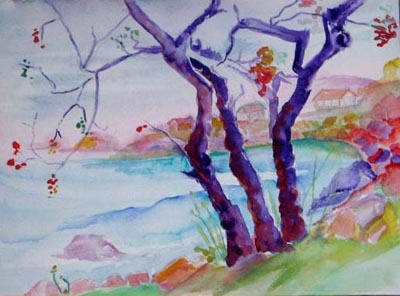 Just minutes away on Shore Road is the Ogunquit Museum of American Art. There is even a system of trolley buses that connects the beaches with restaurants and hotels. In every aspect, The Hartwell House, with its beautiful grounds, homey guest rooms, outstanding warm hospitality, and ideal location may well make your quest for a great romantic southern Maine inn end here- where you will no doubt come away relaxed and renewed-ready to face the world with energy and a smile.